Last week, Pat Hanlon and I attended the 2015 National Future City Competition in Washington, D.C. to represent the Russ College. At the competition, middle school students from around the country displayed their vision of the future. This year’s theme was Urban Agriculture, so each design needed to incorporate ideas about how to supply food for the population of their city. There were a lot of interesting and creative solutions to this problem, including aquaponics, vertical farming, and urban gardens. It was neat to see the students work together to produce a city that incorporated so many things that are vital for their residents. The students’ enthusiasm for engineering and the well being of their city residents makes me extremely hopeful for our future engineers. In my opinion, Future City is a great competition, which is helping to develop extremely creative and conscientious students. Future City is a great event for Ohio University to sponsor and support! The Future City event organizers did a great job congratulating all of the students participating at the national competition. Many students received awards and the celebration party was a lot of fun! This entry was posted in Engineering Ambassadors and tagged engineering ambassadors on February 28, 2015 by dalemasel. Charles R. Stuckey Jr. graduated from Ohio University with a Mechanical Engineering degree in 1966 and then began a career in Information Technology as a systems engineer with IBM. Most recently, he served as president and chief executive officer of RSA Security until 2006. During that time RSA grew from 19 employees to 1,500 employees and was ranked in the top 100 security software companies in the world. Last week, some of the Engineering Ambassadors had the opportunity to share a breakfast with Mr. Stuckey and his wife at the OU Inn. This was a great chance for all of the students to have a conversation with a former Russ College student about his experience and journey after graduation. Mr. Stuckey spoke about how it wasn’t necessarily the knowledge he gained during classes that helped him have so much success. Instead he spoke on how the development of skills like problem solving and how their application is what supported his achievements. This is something all of us were able to relate to, as we’re all starting from the same position he had. We all have large opportunities in front of us and are beginning our own journeys of success. Mr. and Mrs. Stuckey both answered questions and talked about how their relationship was impacted by his work and all of their family moves. It was great to hear how they both thrived through those stressful times by supporting each other and being supported by caring family. The breakfast was an awesome time and a great way for us to learn from an accomplished Russ College alumni. This entry was posted in Engineering Ambassadors and tagged engineering ambassadors on November 24, 2014 by dalemasel. 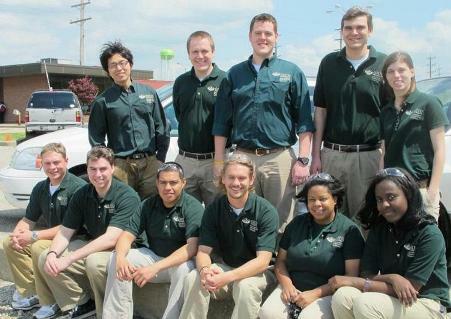 Athens, OH 30 April 2012 – During April 19-20, several of the Engineering Ambassadors had a wonderful corporate trip. The trip was to visit several manufacturing plants including Kenworth Truck, GE Lighting, and GE Aviation. On Thursday morning we first visited Kenworth in Chillicothe. It is a large semi-truck assembly plant that assembles semi-truck to order. Now its capability is around 150 trucks per day, with more than a thousand employees working in the plant. There are more than 10 assembly groups with more than 50 assembly lines in the plant. It makes highly personalized semi-trucks according to customers’ requirements. That afternoon, we went to GE Lighting in Circleville. That is one of the biggest GE lighting plant in the US. They make more than 30,000 of every kind of light bulbs per day. The production lines are highly automated, so the employees in the plant are mostly engineers and technicians. They work to monitor the machines and the products’ qualities, as well as some R&D stuff. 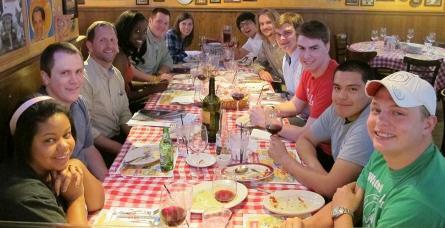 At night, we went to Cincinnati and had a wonderful dinner at Buca di Beppo. On Friday, we had breakfast with Catherine Anbil, a very nice woman who set up her own business on system and software. She introduced her experience on her business and with her partner, and her early life. After the enjoyable breakfast, we continued our trip to the last destination: GE Aviation. This was a long tour. We visited 4 different locations. Generally, we visited the labs that test the materials in different plane engines and we also got a chance to see how an engine was assembled, and how an engine works on a plane. This trip was really an enjoyable trip that expands my horizon and lets me get to know more about the manufacturing in the US. This entry was posted in Chemical and Biomolecular Engineering and tagged engineering ambassadors, outings on June 7, 2012 by ohioengineering.